Hoping you all had a fantastic Thanksgiving with your family and friends!!! And now with Thanksgiving dinner, the turkey, pumpkin pie and mash potato all but gone, it's time now to think about the holiday sales!!! And what better day to start than today! Yes today is Black Friday, the biggest shopping day of the year and after the weekend, there's Cyber Monday, the big online shopping day. In fact, many say that Cyber Monday has become an even bigger shopping day and major retailers are expected to offer their best deals with even bigger discounts on this day. Regardless, this is the time that retailers will offer the best deals and not only on the latest technology and electronics products, but thankfully for us fashionistas, also on designer and fashion clothing, shoes, handbags, jewelry and beauty products as well as luxury apparel as with the deeper discounts, these will be offered at prices that we will not possibly see for the next six to twelve months. So this is serious shopping time and not only for those wishing to hustle through the boutiques and local malls, but also for those that prefer to avoid the crowds and maintain their sanity while looking to score the best deals by shopping online. As well as personal shopping, it's a great time to start our Christmas shopping with lots of great gift ideas out there at deep discounts. So whether you are after the latest Apple iPad and accessories, it's also a great time to shop for designer clothing and perhaps that special pair of shoes and handbag that you’ve been thinking about all year. And when it comes to fashion, here as in previous years, we will progressively list our best finds over Black Friday weekend and Cyber Monday shopping period. Get 25% OFF selected dresses on Cyber Monday at Rosa Pushér with FREE ground shipping within the US ad Canada. Ends Cyber Monday 11PM. Here's another great Cyber Monday deal! Take 40% off all RRR and 20% off all RR plus free shipping on all orders at Rachel Roy. This offer is valid online only through Cyber Monday, November 28, 2011 at 11:59 pm Eastern Time. No coupon code required. Free ground shipping is valid on all orders through December 16, 2011 at 11:59 pm Eastern Time. Up to 80% off hundreds of Stila products at the Stila Online Warehouse Sale starting Cyber Monday November 28 through to December 2nd. Use promo code "FCBLKFRI" and enjoy 30% OFF any purchase this Cyber Monday at French Connection plus FREE shipping on orders over $150. Use promo code "Monday" to bag 30% Off storewide at Black Label Boutique this Cyber Monday. There's a big lineup of designer labels here!!!! On Cyber Monday buy one pair of jeasn and get 30% off the second pair at Paige Denim with free shipping and returns. Use promo code "Cyber20" for 20% Off all merhcandise plus free shipping on all orders at AG Jeans this Cyber Monday, ends at midnight. Use promo code "CYBER25" for 25% Off on all orders over $150 at Lauren Merkin Handbags. Note this offer ends December 10, 2011. Earn an extra 30% OFF on all reduced footwear and handbags at ALDO. This offer is valid online and in stores in the U.S. until 11:59 PM EST on Cyber Monday, November 28th, 2011. For a limited time, ALDO is also offering select women’s styles at 30% OFF the regular price. Cyber Monday sale: Up To 70% OFF on select styles sitewide at INHABIT New York. Enter code SHOPPER30 for 30% OFF sitewide at Tobi. Offer expires Cyber Monday, November 28, 2011 11:59pm PT. Use promo code BLKFRIDAY3011 to take 30% off at 7 For All Mankind. Here's the latest hot off the press 7FAM update!!! Today, Cyber Monday only, use code "CMONDAY4011" to take an extra 40% OFF Sale Items at 7 For All Mankind. Take up to 50% off a selection of jackets, coats and ready-to-wear exclusively at Mackage.com and Mackage NYC flagship through Cyber Monday November 28, 2011 at 11:59pm. This offer includes free ground shipping. On Cyber Monday take 60% off online and in stores at Nine West. This offer ends on November 28, 2011 at 11:58PM ET. Cyber Monday Only, save 25% Off the entire site with promo code Give25 plus Free ground shipping online only at ShopRapunzels.com, sale ends November 28, 2011 at midnight CST. Barneys New York is offering up to 40% off this Cyber Monday on regular priced selected clothing, shoes and accessories for men, women and children as well as gifts for the home both in stores and online. Enjoy 50% Off online on select items at LRG this Cyber Monday until November 29 at 12am. Cyber Monday Sale! Take 42% Off the entire site + FREE shipping with code "CCCYBER42" online at C & C California through November 28 at 11:59PM PT. On Cyber Monday take 40% off the entire Anne Klein New York site. This offer ends on November 28, 2011 at 11:58PM ET. On Cyber Sunday and Cyber Monday use the online promotional code HUGECYBER at checkout to take 30% off on Banana Republic, Gap, Old Navy and Athleta merchandise plus take 20% OFF your favorite Piperlime.com shoes and apparel brands. This offer ends on Cyber Monday, November 28 at 11:59 PM ET. For the love of boots, take $50 off ANY Boot or Bootie purchase at JessicaSimpsonCollection.com! 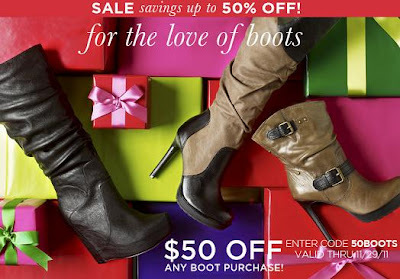 Simply enter code "50BOOTS" through 29 November, 2011. Also check out the fashion SALE savings up to 50% and note that there's FREE standard shipping with nay purchase over $100!!! Yes your read that right! Take 50% OFF Everything at Kensie through the Black Friday weekend. Use code "PRETTYPLEASE" and also enjoy free ground shipping on orders over $100. Neiman Marcus has a surprise for all of us looking for Chrismas gifts during Black Friday! Online online shop select gifts and receive 25% off when you purchase 3 or more, 20% off when you purchase two and 15% when you purchase one all this with free returns, gift packaging and shipping. Use promo code SHIPFALL for free standard shipping. Bag an extra 30% OFF your entire purchase from Black Friday through Cyber Monday at Neiman Marcus LastCall.com and Last Call Stores. Online sale ends November 29, 2011, at 8 a.m. CT.
Latest Update: Extra 40% Off Entire Site this Cyber Monday ends at 2 P.M. CT at LastCall.com. Use code CYBERSALE and bag 25% OFF including sale items at PinkMascara.com with FREE shipping on purchases of $75 or more! Save Up To 40% OFF pre-Fall and Fall styles during the Black Friday through Cyber Monday Sale at Nicole Miller boutiques and NicoleMiller.com. Use code JULES20 for 20% OFF at Jules Smith plus free ground shipping from Black Friday through to December 15. Get 25% Off any order through November 27 with code BLKFRI at Alternative Apparel. From 12am to 12pm MST get 40% off and 30% Off for the rest of the weekend with code "feast" at Lindsay Lou. Latest update: 40% OFF Everything with code "cybermonday" til 11:59pm PST Cyber Monday. It's 30% off the entire Dolce Vita site through Cyber Monday. Discount taken at checkout. Here's yet another exciting Black Friday Sale!!! Shop in-stores and online and take 30-40% off Fall collections at Zoe and also enjoy free domestic ground shipping until December 24th. Spend more, save more with 20-33% off Everything this Black Friday weekend at 80's Purple. This offer expires Sunday, November 27th, 2011 at 11:59pm PST. Use promo code "blackfriday2011" and take 30% OFF at stefaniBags.com through midnight November 27 EST. Enjoy your Black Friday and Cyber Monday 2011 shopping and do follow the Chic Alert on twitter as we will be continuing to tweet breaking news on the latest Black Friday and Cyber Monday deals on clothing, shoes, handbags and jewelry as the sales deets become available! !